We are delighted to feature award winning blogger Mary Campion today. Mary has created a very unique health and fitness blog. She is Irish but now lives in the UK. She took some time out to send us some great tips and information about getting the type of body that many people can only dream of....and with plenty of time left until summer. Heres what do we need to do over the next few months to improve our bodys. 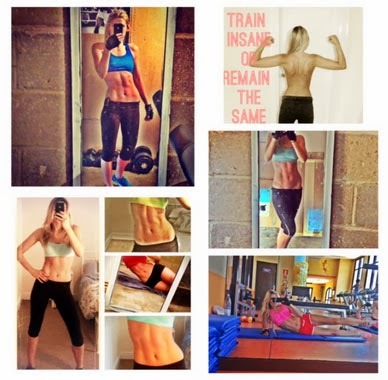 Mary set up her blog “The Chic Physique” just over a year ago to encourage people to get fit and healthy. lot on clean eating and believes that ABS ARE MADE IN THE KITCHEN! Eating clean and healthy is not only going to make you feel good, it is also going to help you break down the fat stores around your belly and Mary always believed that to get the body she wanted, she had to spend hours in the gym doing low intensity cardio like running on a treadmill etc. But that never seemed to work and she never achieved any results with this type of training and got de-motivated quickly. About three years ago, she was introduced to High Intensity Exercising (HIT) and after a lot of research she said she would try it out. "I absolutely loved how challenging the workouts were, how quick they were and more importantly how they shaped my body and gave me abs and muscles I never thought possible. I then started incorporating weight lifting with my HIT exercises to achieve even greater results. Girls can be afraid of weight lifting as they believe that they will achieve that manly muscular look. Trust me this is not true, muscle burns fat and gives girls that lean toned look." Remember Strong is the new Skinny! If you wish to contact Mary, see the following links for more details. So there you have it, Marys top tips for a fab body in 2014. Let us know your thoughts and comments and if any of you have tried HIT and strenght training, how is it going for you. Fantastic site you have here but I was curious about if you knew of any user discussion forums that cover the same topics discussed in this article?